In Kerry O’Brien’s riveting interview with Paul Keating, the former treasurer and prime minister said the people who lost their jobs in the “recession we had to have” (1991) ended up getting better ones. That’s what the optimists say about automation: that the machines are just replacing unpleasant machine-like jobs with better ones. Except that this is not a recession – employment is going backwards while the economy is booming. Maybe jobs growth will catch up with capital expenditure and GDP later, but it’s hard to imagine the definition of full employment getting back to what it was before the rise of the machines. I posted some thoughts and charts on this very subject back in February (see Random Analytics: Peak Employment (Part I): Australia) but I thought it might be worthwhile having another look at the updated data and republishing the full-time/part-time charts. I’ve also included a new chart looking at how full-time employment and part-time employment has progressed since the Global Financial Crisis (aka Global Recession). The first phase of peak employment was not due to ‘the rise of the machines’ but to the rise of China. Machine like jobs, such as manufacturing were not immediately automated but rather offshored to less developed parts of the world. Since 1978 as Australia’s economy has moved from labour intensive industries to one dominated by service and digital employments there has been a 59.4% increase in full-time employment and a massive 285.4% increase in part-time work. 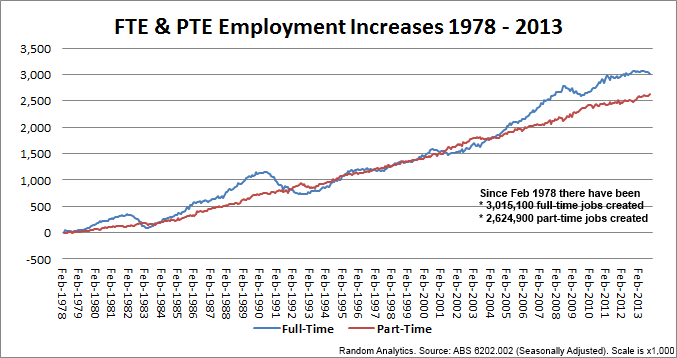 As the above chart shows part-time employment has been steadily increasing, even through the last Australian recession of 1991-1992. At the same time full-time employment has atrophied during recessionary periods (1983, flat-lined 1987, 1991-1992, 2008 and currently flat-lined since 2011). 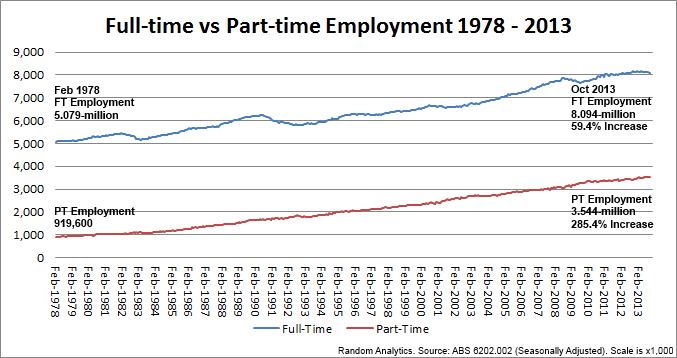 To emphasise the rise of part-time employment the next chart looks at new job creation since 1978. 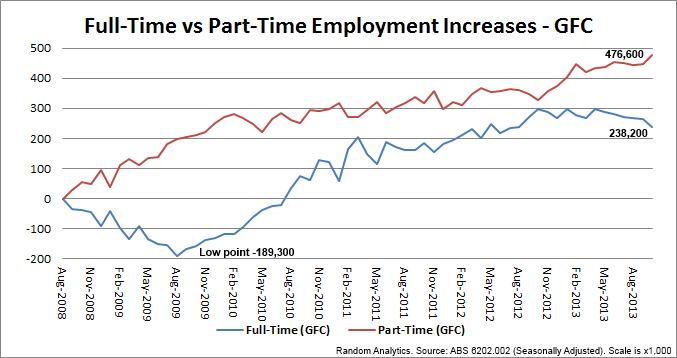 As you can see, when times are good the full-time employment numbers spread increases above part-time employment. During two of the last three recessions (1983, 1991-92) the full-time employment numbers have collapsed back under the part-time line. Between 1995 – 2005 both employment types grew at an even pace but as the last big boom kicked on past 2004 the spread increased substantially. The start of the GFC saw full-time employment decrease substantially but dual local and Chinese stimulus packages allowed Australia to avoid recession. This is the new inclusion and my favourite chart. Since the collapse of Lehman Brothers the Australian economy has created two part-time jobs for every new full-time job created. At the bottom of the crisis Australia shed 189,300 jobs at the same time creating 198,800 part-time employees. As was recently discussed in a Business Spectator piece the Australian automotive industry is in crisis, with 150,000 automotive manufacturing jobs on the line. According to Bernard Salt, the entire Manufacturing Sector could further decline by 300,000 over the next decade. Robert Gottliebsen believes the tapering of mining sector investment will cost another 150,000 jobs, penalty rates and a move to online trading will see another 150,000 jobs go from retail. The public service is also cutting back on employment, especially full-time thus up to half-a-million jobs are on the line over the next few years. To summarise, the first phase of peak employment was the offshoring of machine like jobs, the next phase which is currently underway is as Alan Kohler points out the ‘rise of the machines’. The future global employment story will be one that will be dominated by reducing full-time employment, an explosion in part-time, contingent, contractual and freelancing structures and the ongoing integration of robots and algorithms into our workforce.